It wasn’t long ago – in this very blog, in fact – that I was raising the not uncommon hypothetical question: why doesn’t Adobe just combine all the greatest elements of Photoshop, Illustrator and InDesign into one almighty, all-powerful package that can do everything? The blog went on to describe some of the best practices for using InDesign and Photoshop together, but there was something that I didn’t touch on at all – Adobe Bridge. Adobe Bridge is essentially a media browser or file finder, much will already be installed on your PC. It allows you to efficiently locate, organize, browse, preview, and batch process your content files – including most image, vector, audio and video files. Like it’s name implies, the application is essentially a bridge or gateway between your most frequently used Adobe applications, such as InDesign, Photoshop and Illustrator. 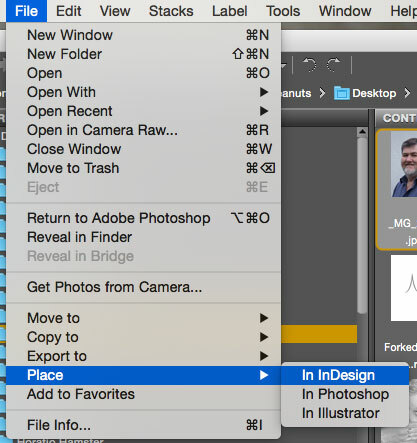 To break it down even more, InDesign, Photoshop and Illustrator all have different functions. Illustrator is all about creating vector graphics, Photoshop about editing and enhancing photos and other raster-based imagery, and InDesign is the application where you put all of your graphics together in one document or project. Now, to go back to the question, “why doesn’t Adobe just combine all the greatest elements of Photoshop, Illustrator and InDesign into one almighty, all-powerful package that can do everything?”, with Adobe Bridge the reason perhaps becomes a little more clear. When you’re running Adobe Bridge, there’s no need for all of the power of InDesign, Photoshop and Illustrator to be combined into one almighty application, for Adobe Bridge links all three (and other Adobe applications) seamlessly, allowing the user easy access to Photoshop and Illustrator files whilst working in InDesign. Put simply, it allows for optimised workflow on your creative projects. Sound good? It should, for you can even download it absolutely free, either by itself, or together with other Adobe Creative Cloud Projects. But just in case you need a little more convincing, here are a few more reasons why you should be using Adobe Bridge to improve your workflow. As I touched on above, one of the best features of Adobe Bridge is its ability to allow the user to gather all the digital assets he/she needs in one central location before commencing work. So, say, you want to design a flyer for an upcoming event. You’ve made all the separate graphics for the flier in Illustrator, but have (sensibly) chosen to put the document together in InDesign. This is the moment where you want to fire up Adobe Bridge. From within Bridge, you can simply place the Illustrator files into the InDesign application by selecting File > Place > InDesign. Of course you can also use this feature with nearly all of the programs on the Creative Cloud, making it that much easier to distribute digital assets into your projects without having to go through repetitive place commands and menu clicks. This is the most obvious use for Bridge, but really it’s where Bridge truly excels as a product. The navigation, search, keyword tagging, and ability to handle mixed media files are all unmatched by any other application that’s out there, quite frankly. Not to mention the fact that Bridge makes it super easy to import files from a digital camera or external drive (File > Get Photos from Camera…), and also allows you to effortlessly move files to new locations on your hard drive without having to leave its interface. The Mini Bridge panel is one of the best things Adobe has added in the past few years to (certain) Adobe Creative Cloud applications. While it’s currently only available in Photoshop and InDesign, the Mini Bridge allows you full access to your files directly from within other applications, allowing you to easily open/place files as needed without having to leave the app you’re working in. This is a huge timesaver, and surely it’s only a matter of time before they add this feature to the rest of the apps in the CC product line. To access Mini Bridge in Photoshop go to Window > Extensions > Mini Bridge. In InDesign, navigate to Window > Mini Bridge. These are Just the basics, of course, of getting started with Adobe Bridge. To fully get to grips with the program then you will need to partake in some training. We run InDesign, Photoshop and Illustrator courses here, and we make learning Adobe Bridge part and parcel of the training. Book now to guarantee your place. Thank you. I love adobe bridge, but understanding how it works with the cloud, that is training I need. 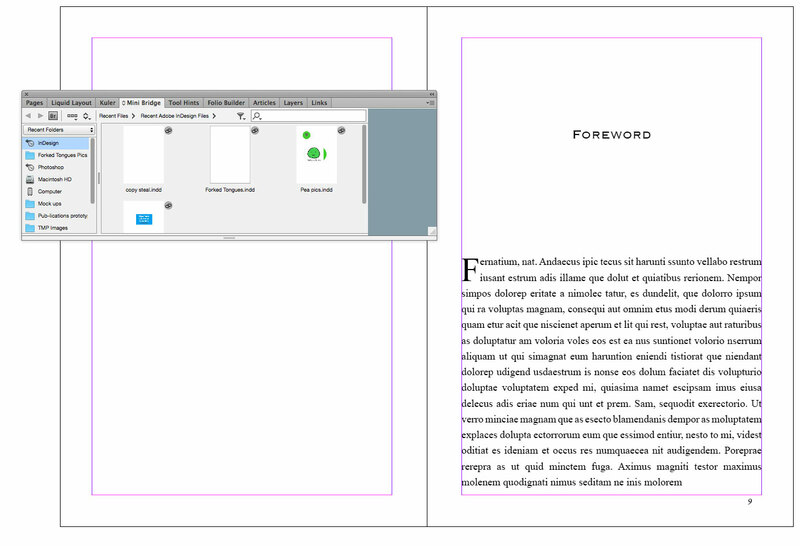 Just simply place the Illustrator files into the InDesign application by selecting File > Place > InDesign. making it that much easier to distribute digital assets into your projects without having to go through repetitive place commands and menu clicks. Adobe bridge in good software which allow to transfer files to any adobe application. The cloud is veyr helpful for me as well as for many other users.